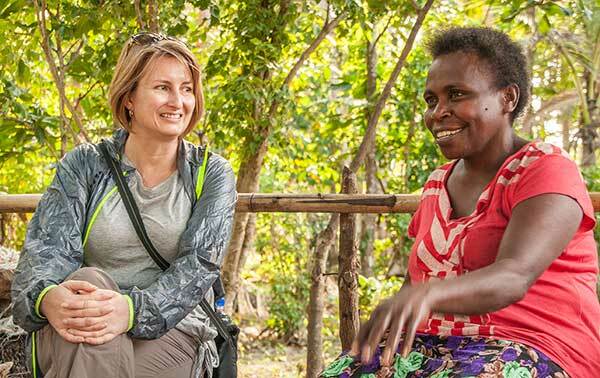 The apparent tranquillity of life and the moniker attributed to the ni-Vanuatu people as among the happiest on the planet belies the fact that Vanuatu is one of the most dangerous places on earth for a woman to live and raise her family. With high levels of susceptibility to natural disaster combined with an inability to adequately prepare for and cope with them, Vanuatu is ranked as the country with the highest disaster risk of extreme natural events (World Risk Report 2018). And unfortunately for women, the risk of harm is exacerbated closer to home as six in every 10 women report experiencing violence from an intimate partner at some point in their life (UN Women, EVAW Global Database). These seemingly contradictory images of Vanuatu were highlighted for me on my visit there in August. My only previous visit had been some 25 years prior – on my honeymoon! On that trip I gave no thought to the impacts of a changing climate, the risks to life and livelihoods or the daily threat to many women and girls. But back then, as now, Anglican Overseas Aid’s (AOA) partner, the Anglican Church of Melanesia (ACOM), was a part of the community, providing the strength and guidance needed to stand against these threats, just as it is currently doing on the remote island of Maewo. Maewo has a population of about 3,000 people. This population doubled as refugees from the nearby island of Ambae were relocated there due to the volcanic eruption. Men, women and children are still being housed in tents, dispersed among existing communities. ACOM is working tirelessly to help the locals accept, welcome and support the people relocated from Ambae. And for women like Trudy Butu, her family’s capacity to welcome and care for the stranger has been made more manageable through her involvement with the Women’s Livelihoods and Empowerment Program, a collaboration between AOA and ACOM. Trudy has always been enterprising and, along with her husband Jerry, wants to provide in the best way she can for her five children aged from 17 down to 5 years old. So, a couple of years ago, she took up an offer of an air dryer from a business group with the intention of becoming a producer of coconut oil. However, with no knowledge of how to actually use the dryer, it sat idle until she heard about the Women’s Livelihoods and Empowerment Program from a friend. Ethel George, the Women’s Desk Officer from ACOM, arranged for Trudy to attend intensive training conducted by the Vanuatu Chamber of Commerce. Trudy keeps to a committed savings regime through her membership of her local village savings and loans group, also established by ACOM. The Savings with Education Program teaches Trudy and the other 47 women in the group about financial literacy and saving, equipping them to take small loans and develop their businesses. 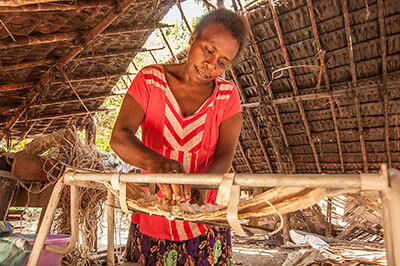 Now the President of her savings group, she is helping other women with their savings as well. 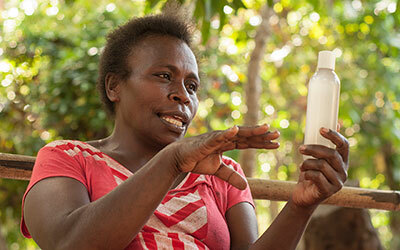 She is confident she will have enough saved by Christmas to be able to purchase her solar lighting. “The Anglican Church helped me find the knowledge and the confidence to help my family and the other women in the community. They believed in me, and I’m so grateful for that”, Trudy explains. I’m also grateful for our partnership with the Anglican Church of Melanesia and feel privileged that we assist to build strong communities, minimise risks and undermine threats, particularly for some of the most vulnerable women in this beautiful, contradictory nation. NB: The Women’s Livelihood and Empowerment Program is part of the Australian NGO Co-operation Program, an initiative of the Australian Government. 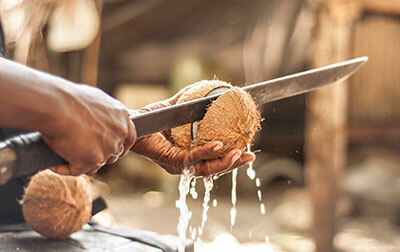 Breaking a coconut open with a machete releases the coconut juice. Trudy with a bottle of coconut oil.